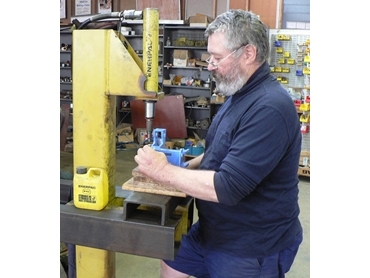 A Melbourne metal engineering company has employed the power and precision of compact Enerpac 700 bar hydraulics to streamline manufacture of its custom-fabricated range of flooring clamps. John A.L. Mills and Associates combined its computer-aided metal design and fabrication experience with Enerpac hydraulic tools, including an RC1010 cylinder located in a pedestal press and powered by a hands-free, pedal-operated PATG 1102N Turbo II air hydraulic pump. Using high-pressure 700 bar technology to reduce cylinder weight and size while maximising compact power, the high-strength alloy steel RC cylinders in capacities of 5-95 tons are part of an Enerpac range of safety-oriented, energy saving and labour-saving technologies. John A.L. Mills and Associates’ 10-ton RC 1010 cylinder is safely and remotely actuated by the treadle-operated pump that leaves the operators’ hands free for any necessary adjustments, says Company Director John Mills. Mr Mills and his son Laurence use a vee-block and ram to bend three of the flooring clamp’s components, employing Enerpac hydraulics because of the high force needed for the job and fine control the hydraulics gives them. “We also use the ram and fixture to drive in spring-pins that hold key sub-assemblies together. This is far superior to driving the pins in by hand, as the power and control of the Enerpac cylinder minimises damage to the powder-coated body,” said Mr Mills. “We also use Enerpac hydraulic power to stake our thumbscrews together, to crush the tube used on the floor clamp handles prior to fabrication, to bend the rod for the actuator screw, and to stamp our name on certain components for branding. “Each of these operations demonstrates ways in which we have used Enerpac technology to achieve cost-efficient manufacture, been able to do more of the work in-house, and ensure the quality of our product is of a consistently high standard. “We have been building the clamps for over five years, and we are always looking for ways to improve the product, both from the point of view of the user and the manufacturer. Enerpac has increased our capabilities whilst enabling us to Stablise prices, maintain profitability and improve productivity through smarter manufacture,” said Mr Mills, whose flooring clamps are employed nationally on timber joists, concrete slabs, chipboard, and with secret nailing. Enerpac’s single-acting general purpose RC cylinders are a ubiquitous workhorse of Australian industry because of their combination of compact power and rugged versatility. Available in 39 models with strokes from 16-362mm, the cylinders are part of a comprehensive range of high-pressure (700 bar) cylinders trusted in Australasia for more than 50 years. The RC range – part of a broader Enerpac cylinder range in capacities exceeding 1,000 tons – is complemented by a broad range of advanced pumping technologies from Enerpac, ranging from simple portable hand pumps and versatile battery pumps to new generation electric and air-over-hydraulic technologies. These include cool-running and energy-saving ZU4T electric pumps and new generation 700 bar XVARI XA air-over-hydraulic foot pumps which enable finer and safer control of tasks while completing jobs up to twice as quickly as conventional pumps.